This powerful Ryobi 7 1/4-inch Circular Saw comes equipped with a contoured design and front pommel handle for added comfort and grip, as well as a 12 amp motor and a 20-tooth steel blade. The saw also offers on-board wrench storage and an adjustable depth of cut with quick reference scale to improve cutting accuracy and convenience. Evolution RAGE 4, 7-1/4-Inch, TCT, Multi-Material Chop Saw is capable of cutting steel, aluminum, wood with nails in and plastic. This award winning machine is the perfect tool for slicing through rebar, bolt trimming and other small awkward applications. Plus it has the ability to cut through 2 by 4 planed lumber and reclaimed lumber with nails and screws. This saw is an essential tool to any tradesman. 13-Amp 7-1/4 in. 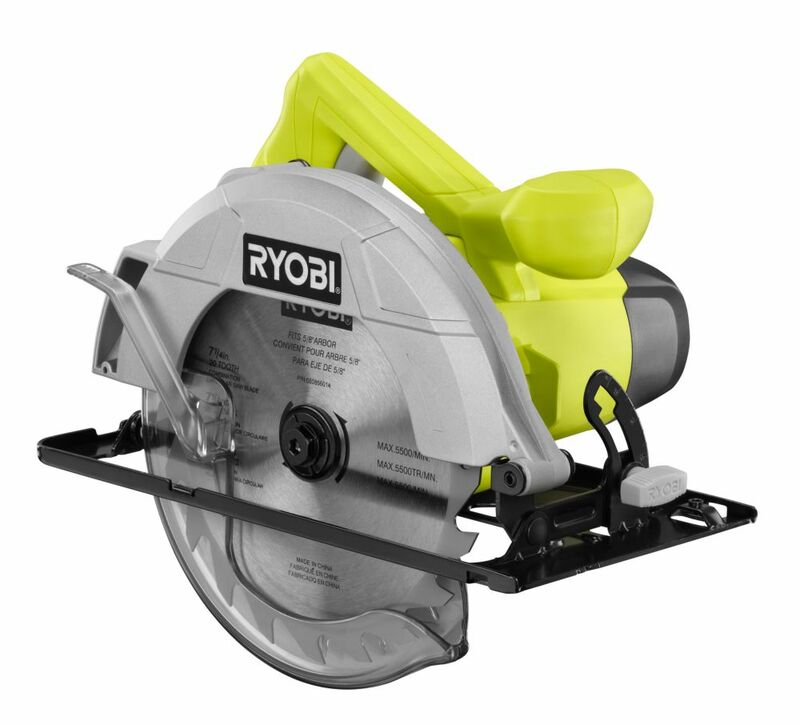 Circular Saw This powerful Ryobi 7 1/4-inch Circular Saw comes equipped with a contoured design and front pommel handle for added comfort and grip, as well as a 12 amp motor and a 20-tooth steel blade. The saw also offers on-board wrench storage and an adjustable depth of cut with quick reference scale to improve cutting accuracy and convenience. 13-Amp 7-1/4 in. Circular Saw is rated 3.8 out of 5 by 546. Rated 4 out of 5 by boxhead from good value for projects around the house. probably would not hold up in day to day environment.I ... good value for projects around the house. probably would not hold up in day to day environment.I bought a $15 blade for cutting plywood and cuts were much smoother, (fewer splinters) than blade that comes with saw. Rated 5 out of 5 by Travis from Cuts like a charm, and is what I needed for... Cuts like a charm, and is what I needed for some small projects. The cord could be a little longer, but hey... that's what extensions are for. Great price!